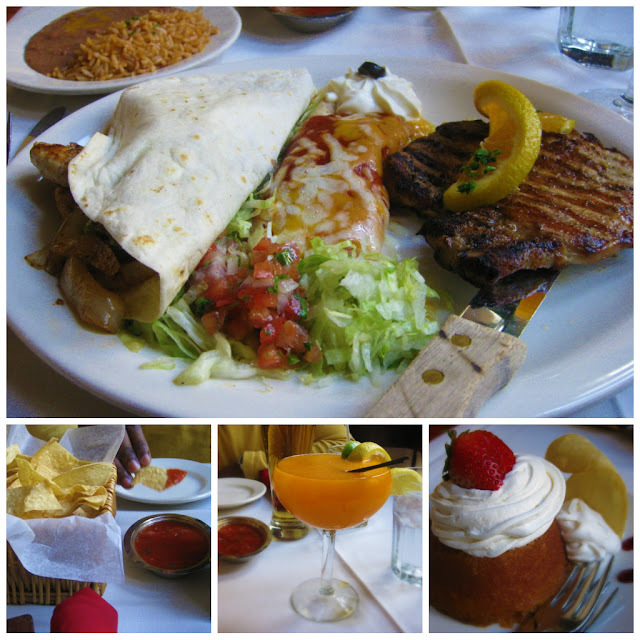 We love Latin American food. A month ago I met a few fellow foodies while waiting for takeout at a Vietnamese restaurant. They suggested we visit El Serrano, a Peruvian restaurant, in Lancaster, PA. It immediately went on our list. We finally made it out there today and we weren't disappointed. We started with the complimentary chips and salsa. The salsa was smooth (not chunky) and mild. The chips were fresh, but not greasy or soggy. The hubby enjoyed an Amstel Light and I had a Fuzzy Rita (fuzzy navel mixed with frozen margarita). My drink was very peachy, fresh, and not sickeningly sweet - just the way I like it! My next course was a seafood soup with a tomato base. The soup had calamari, red snapper, mussels, and other unidentifiable (but delicious) seafood. I ordered the El Gordo Combo because I wanted a bit of everything. It came with a chicken fajita, a cheese enchilada, a pork chop, rice, and refried beans. The chicken fajita was huge and stuffed with juicy marinated chicken, sauteed onions and peppers, and even sauteed tomatoes. The cheese enchilada was had a spicy sweet red sauce. The pork chop was a bit dry for my taste, but it was well seasoned. We were almost too full for dessert, but we had to have the full experience. We were disappointed that they didn't have our beloved tres leches cake (but then again, this wasn't a Mexican restaurant), but we enjoyed the warm rum cake with whipped topping (not freshly whipped cream, to my dismay). Overall it was a great experience. The restaurant looks like a South American hacienda and we are looking forward to dining at their two other restaurants on the same premises. We ate a huge lunch at 3:00 and it kept us full through hours of shopping at the outlet shops in Lancaster. We'll be back.